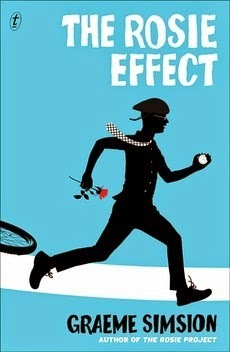 From Goodreads: THE ROSIE PROJECT WAS COMPLETE BUT I WAS UNPREPARED FOR THE ROSIE EFFECT. Thoughts: I loved The Rosie Project. It was funny and quirky. Funnily enough, this made me a little hesitant about The Rosie Effect. Kind of a too much of a good thing. On the whole I was wrong. Once again, Simsion has written an enjoyably quirky book with lots of laughs and giggles to be had. Is it as good as The Rosie Project? Not in my opinion, but it comes close. My biggest problem is one I frequent have with sequels - the characters don't change at all. I get Don's issues - his need to adhere to the rules, his totally logical and unemotional way of looking at things - but I think I did expect him living with Rosie would loosen that up a bit. Maybe not loosen, but teach him to look at things from the perspective of someone else, especially since he has the motivation of loving Rosie. I think I expected him, as a fairly intelligent man to look at something and think I don't understand why they think like that, but...and he doesn't. He continues to expect everyone to see the world as he does and is truly perplexed when they don't. I think Simsion has taken the The Rosie books as far as he can. I really hope there isn't another one. Don's inability to change would make another book a farce. I really hope he does write more, just not about Don and Rosie.